An infrared heater that covers all the basics and maintains heater longevity against all others, GordonRay® BH infrared. A positive pressure infrared heater design combines the reliable features shared by other available infrared heaters. This heater offers the largest number of burner inputs, against all other Roberts Gordon infrared heaters available. A detailed Installation, Operation and Service manual is included with every heater. Leading against the competition, a three-year limited warranty on all components is also included. Unlike other infrared heaters, no need to worry about loosing the burner box door. A hinged burner box allows easy access to electrical components during annual maintenance and fall season start-up. High efficiency aluminum reflectors direct the heat where it is needed most, minimizing heat loss. With infrared heat absorbed within the floors and objects, heat is then re-released into the environment creating a more even heat distribution. 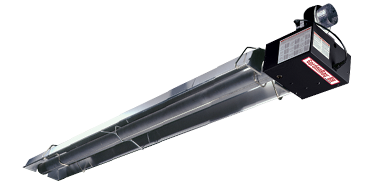 Infrared heater configurations in straight, u-tube or angled utilizing a 90 degree bend accessory, allows heat to be concentrated in areas where it is needed most. For use in a more discrete location, decorative grills are available to disguise the infrared heater within the space. *Clearances to Combustibles applies to heater hanging horizontally. Dimension listed for distance below heater.